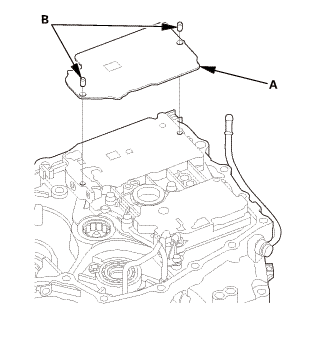 Remove the transmission range switch cover (A). 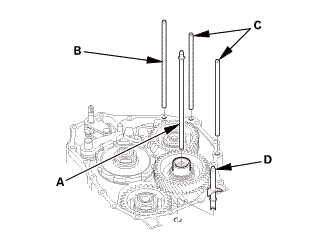 Remove the transmission range switch (B). 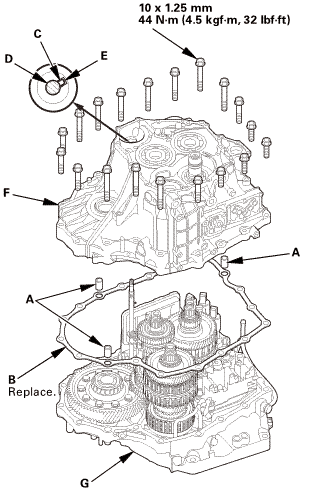 Remove the transmission range switch subharness (A). Remove the clamp brackets (B). Remove the ATF warmer bracket (A). 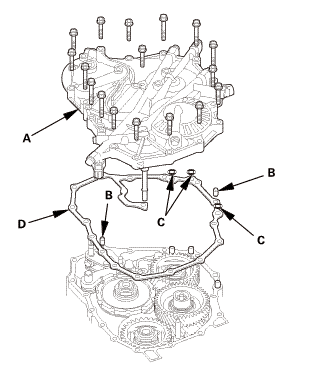 Remove the end cover (A), the dowel pins (B), the O-rings (C), and the end cover gasket (D). 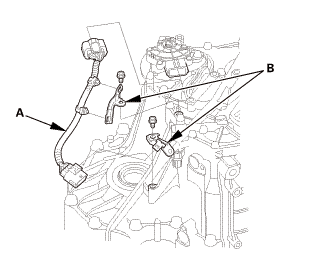 Remove the input shaft (mainshaft) speed sensor (A) with the O-ring (B). 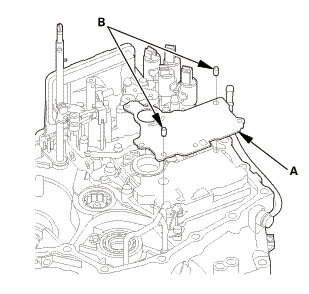 Remove the output shaft (countershaft) speed sensor (A) with the O-ring (B). 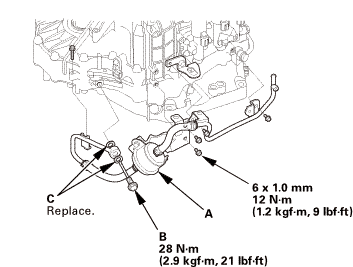 Remove A/T clutch pressure control solenoid valve A with the ATF joint pipes (B), the O-rings (C), the 35 mm ATF pipe (D), and the gasket (E). 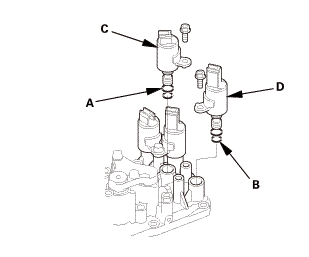 Remove A/T clutch pressure control solenoid valves B and C with the ATF joint pipes (A), the O-rings (D), the 50 mm ATF pipe (E), and the gasket (F). 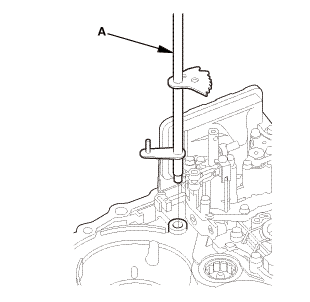 Remove the banjo bolt (A) with the sealing washers (B). Remove the ATF inlet line/ATF hose/ATF filter assembly (C). 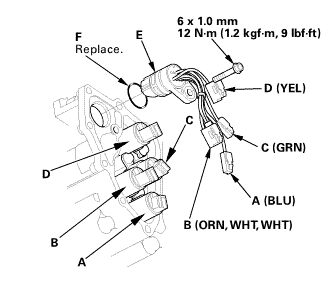 Remove the shift solenoid wire harness (B) with the O-ring (C). Remove the 6 x 199 mm ATF pipe (A). Remove the 8 x 192.5 mm ATF pipe (B). Remove the 8 x 180.5 mm ATF pipes (C). Remove the ATF lubrication pipe (D). Install the mainshaft holder onto the mainshaft. Engage the park pawl with the park gear. 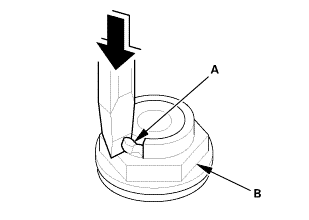 Using a chisel, cut the lock tab (A) of the locknut (B). NOTE: Keep all of the chiseled particles out of the transmission. 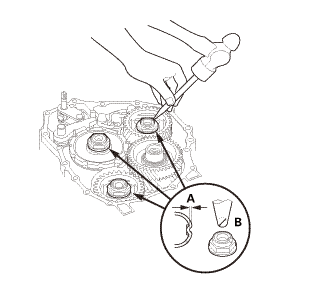 Remove the locknuts (A) and the conical spring washers (B) from each shaft. The countershaft and secondary shaft locknuts have left-hand threads. Keep all of the chiseled particles out of the transmission. Clean the old locknuts; they are used to install the press fit idler gears and park gear. 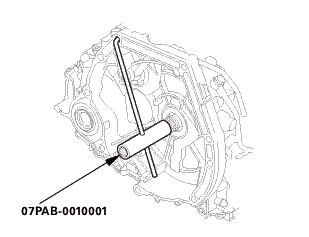 Remove the park pawl (A), the park pawl spring (B), the park pawl shaft (C), and the stop shaft (D). Pry down the lock tab of the lock washer (E). 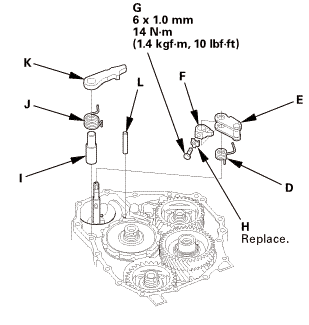 Remove the lock bolt (F) and the lock washer. Remove the park lever (G), the park lever stop (H), and the park lever spring (I). 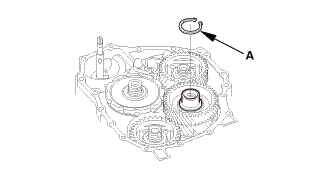 Remove the snap ring (A) securing the idler gear to the idler gear shaft. 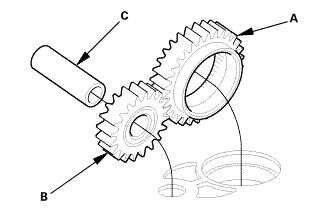 Install a puller (A) with two 6 x 1.0 mm bolts (B) on the idler gear shaft idler gear (C). 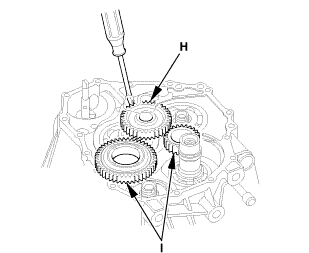 Set a spacer (D) between the puller and the idler gear shaft (E). 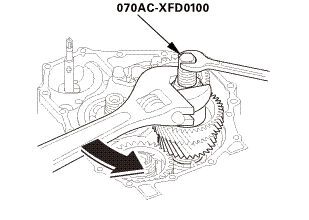 Remove the idler gear shaft idler gear. 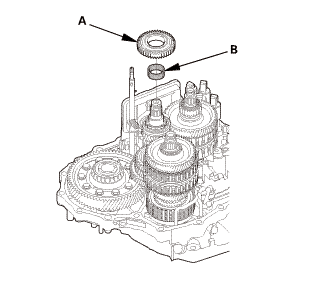 Install a puller (A) with two 6 x 1.0 mm bolts (B) on the mainshaft idler gear (C). Set a spacer (D) between the puller and the mainshaft (E). 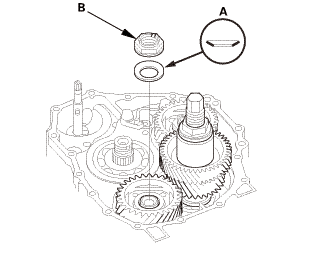 Remove the mainshaft idler gear. 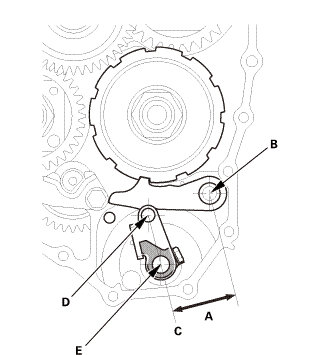 Place a spacer (A) on the countershaft (B). Set a commercially available bearing puller (C) on the park gear (D). 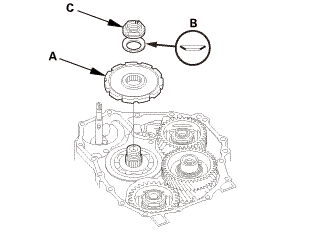 Install a puller (A) with two 6 x 1.0 mm bolts (B) on the secondary shaft idler gear (C). 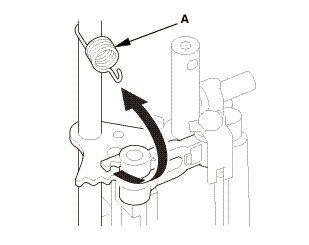 Set a spacer (D) between the puller and the secondary shaft (E). 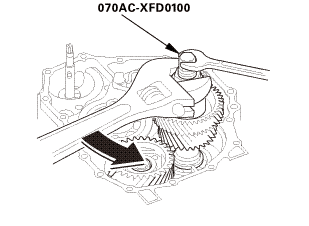 Remove the secondary shaft idler gear. 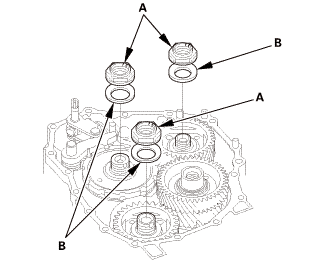 Align the spring pin (A) on the selector control shaft (B) with the transmission housing groove (C). NOTE: Do not squeeze the end of the selector control shaft tips together when turning the control shaft. Install the housing puller over the countershaft. NOTE: If the top arm of your housing puller is too short, replace it with 205 mm housing puller arm 07SAC-P0Z0101. 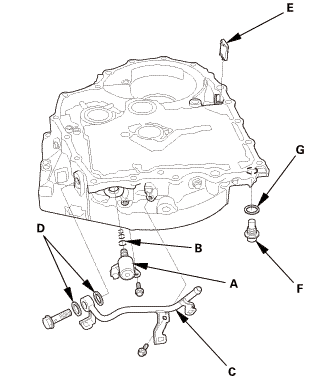 Remove the transmission housing mounting bolts (D). 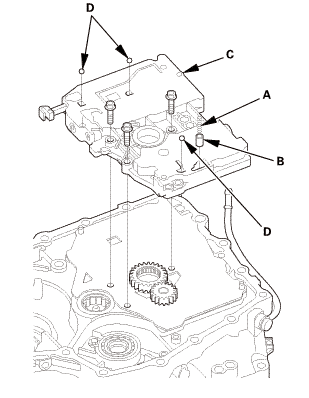 Remove the transmission housing (E) using the housing puller. 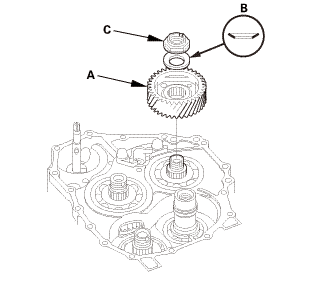 Remove the countershaft reverse gear (A). 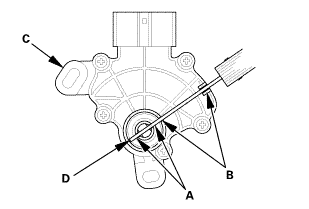 Remove the needle bearing (B). Remove the reverse shift fork (C) with the reverse selector (D) together. 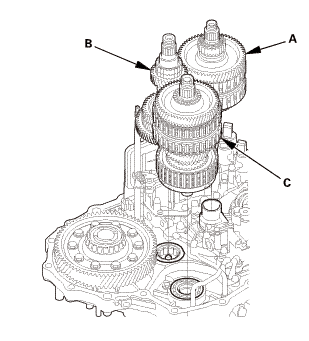 Remove the mainshaft subassembly (A), the countershaft subassembly (B), and the secondary shaft subassembly (C) together. 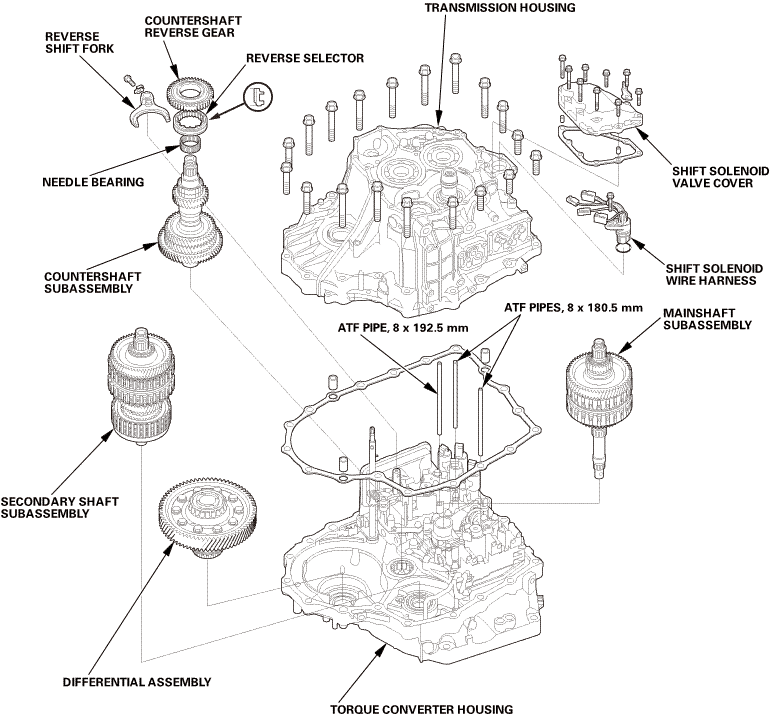 Remove the differential assembly (A). 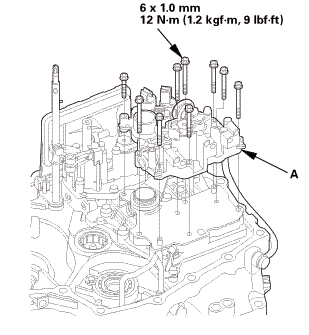 Remove the regulator valve body (A). 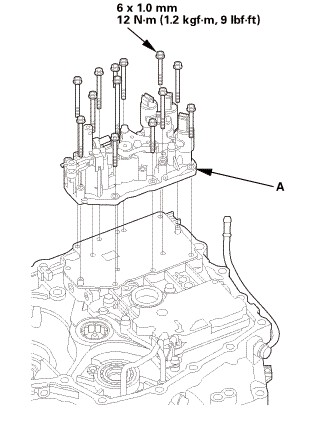 Remove the stator shaft (A) with the O-ring (B). 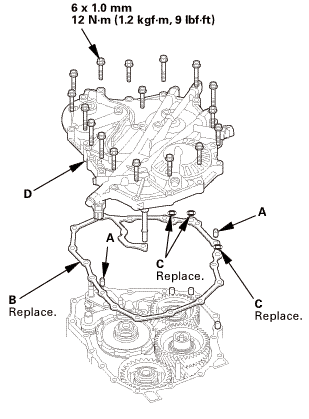 Remove the stator shaft stop (C). 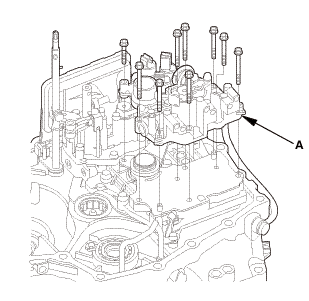 Remove the regulator separator plate (A) and the dowel pins (B). 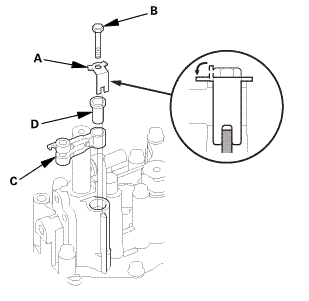 Remove shift solenoid valve C with the O-rings (A). 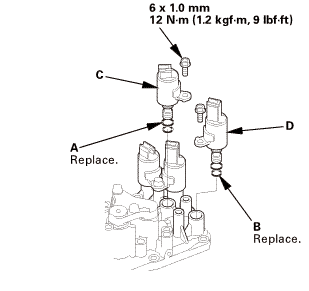 Remove shift solenoid valve D with the O-rings (B). 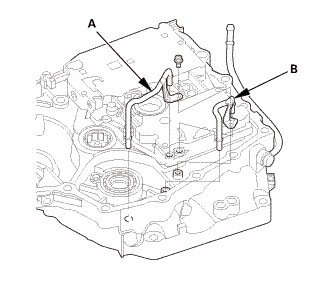 Remove shift solenoid valve A with the O-rings (C). 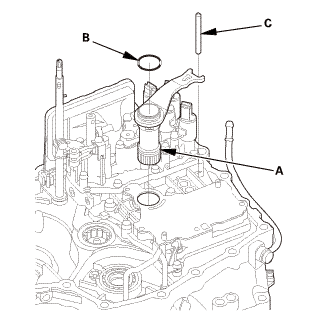 Remove shift solenoid valve B with the O-rings (D). Unhook the detent spring (A). 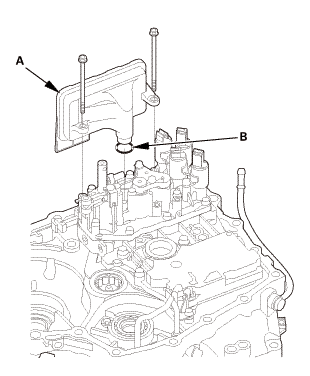 Separate the manual valve lever pin (A) on the selector control shaft (B) from the guide of the manual valve (C). 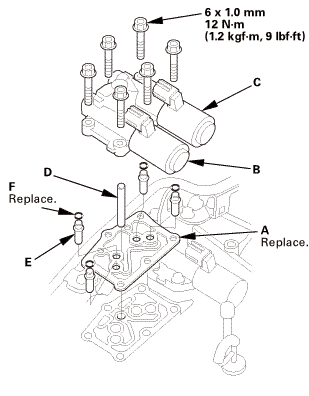 Remove the selector control shaft (A). 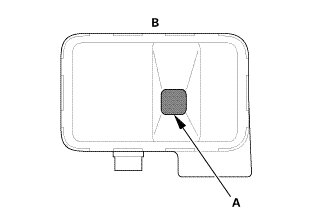 Remove the ATF strainer (A) with the O-ring (B). 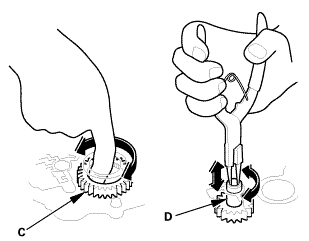 Clean the inlet opening (A) of the ATF strainer (B) thoroughly with compressed air, then check that it is in good condition and that the inlet opening is not clogged. Test the ATF strainer by pouring clean ATF through the inlet opening, and replace it if it is clogged or damaged. Pry up the lock tab of the lock washer (A). 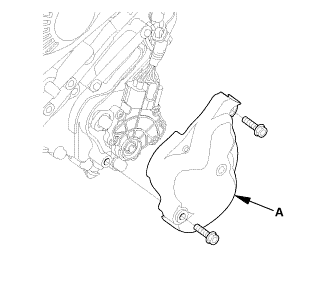 Remove the detent arm (C) and the arm collar (D). 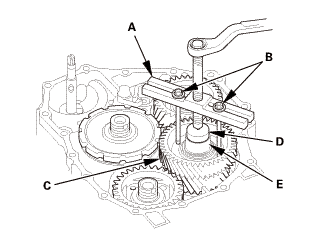 Remove the servo body (A). 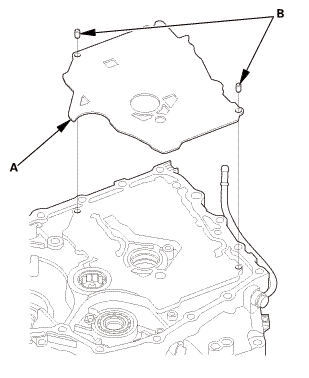 Remove the servo separator plate (A) and the dowel pins (B). Remove ATF joint pipe A. Remove ATF joint pipe B. 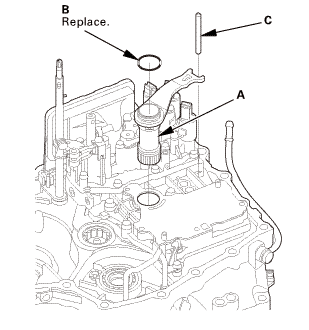 Remove the cooler check valve spring (A) and the cooler check valve (B). 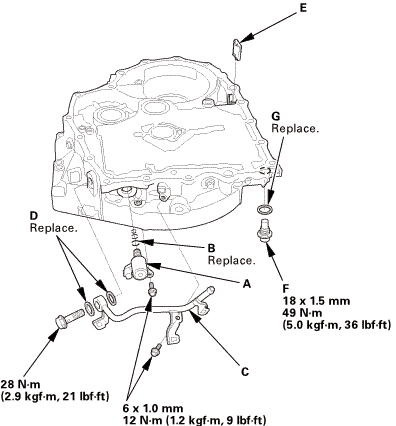 Remove the main valve body (C). NOTE: Do not let the check balls (D) fall out, and do not use a magnet to remove the check balls, it may magnetize them. Remove the ATF pump driven gear shaft (A). 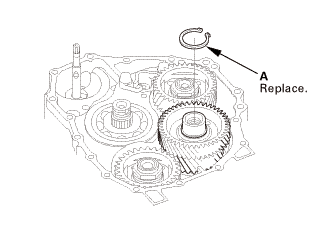 Remove the ATF pump drive gear (B) and the ATF pump driven gear (C). 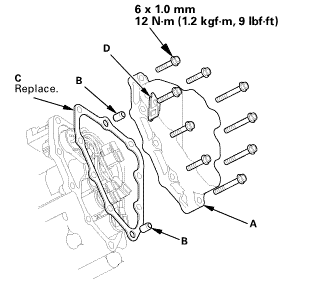 Remove the main separator plate (A) and the dowel pins (B). Remove line pressure solenoid valve A with the O-rings (B). Remove the ATF outlet line (C) with the sealing washers (D). 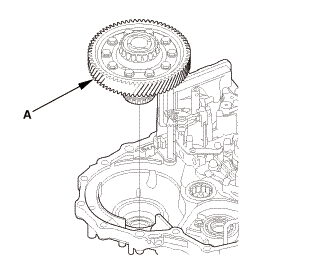 Remove the drain plug (F) with the sealing washer (G). NOTE: Apply a light coat of clean ATF on all tubes, O-rings, and moving parts before reassembly. Install line pressure solenoid valve A using new O-rings (B). Install the ATF outlet line (C) using new sealing washers (D). Clean the magnet (E), then install it. 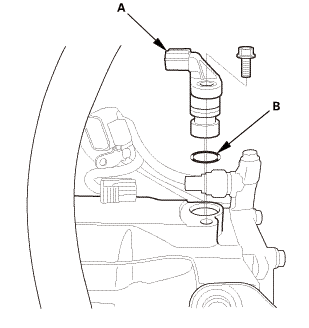 Install the drain plug (F) using a new sealing washer (G). Install the main separator plate (A) and the dowel pins (B). 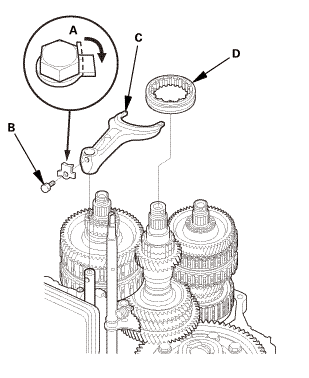 Install the ATF pump drive gear (A) and the ATF pump driven gear (B). NOTE: Install the ATF pump driven gear with its grooved and chamfered side facing down. Install the ATF pump driven gear shaft (C). Install the main valve body (A). 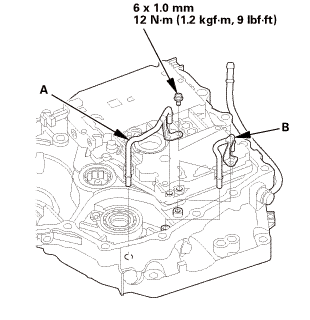 NOTE: Make sure that the check balls (B) are in the main valve body. Make sure the ATF pump drive gear (C) rotates smoothly in the normal operating direction, and the ATF pump driven gear shaft (D) moves smoothly in the axial and normal operating direction. 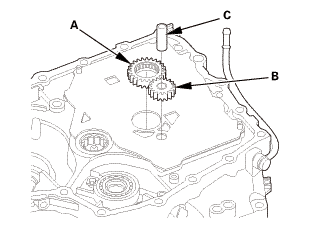 If the ATF pump drive gear and the ATF pump driven gear shaft do not move smoothly, loosen the main valve body bolts. Realign the ATF pump driven gear shaft, and retighten the bolts to the specified torque, then recheck. NOTE: Failure to align the ATF pump driven gear shaft correctly will result in a seized ATF pump drive gear or ATF pump driven gear shaft. 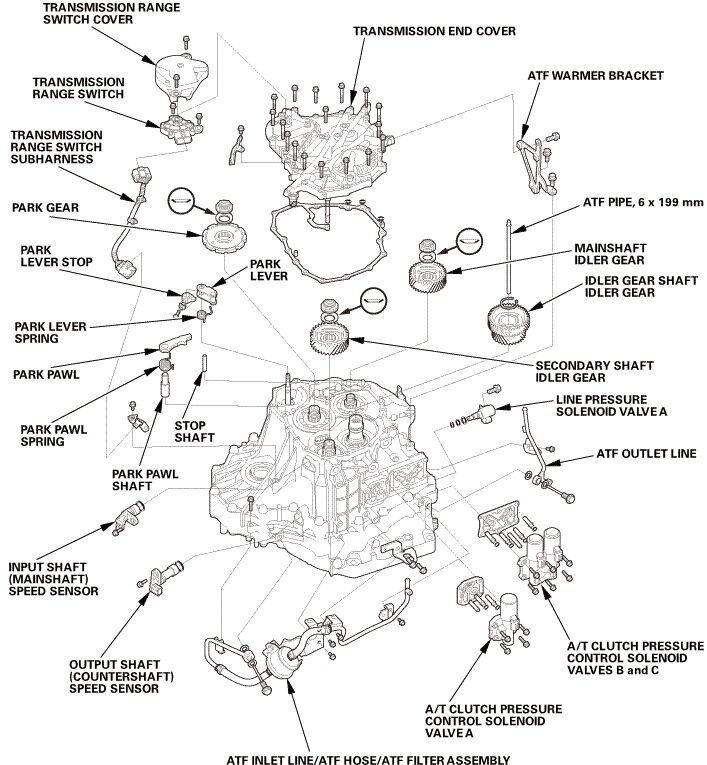 Install the cooler check valve (E) and the cooler check valve spring (F). Install ATF joint pipe A. Install ATF joint pipe B. 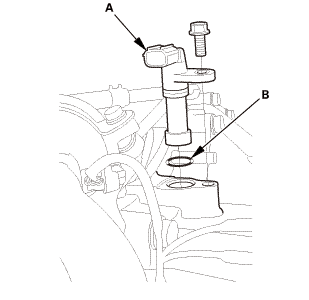 Install the servo separator plate (A) and the dowel pins (B). Install the servo body (A). Install a new lock washer (C) by aligning its cutout (D) with the projection (E). Install and tighten the bolt, then bend the lock tab (F) of the lock washer against the bolt head. 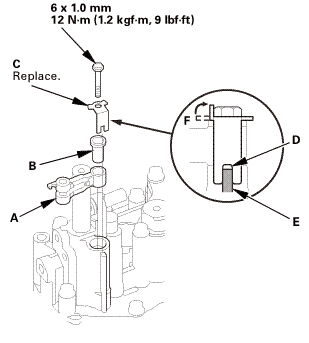 Install the ATF strainer (A) using a new O-ring (B). Install the selector control shaft (A). 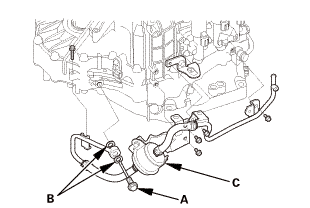 Align the manual valve lever pin (A) on the selector control shaft (B) with the guide of the manual valve (C). 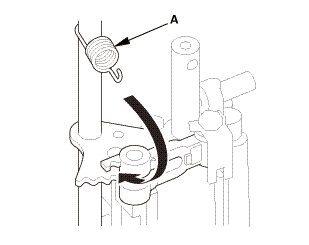 Hook the detent arm spring (A). Do not hold the shift solenoid valve connector to install the shift solenoid valves. Be sure to hold the shift solenoid valve body. A new shift solenoid valve comes with new O-rings. If you install a new solenoid valve, use the O-rings provided on it. Install shift solenoid valve B (black connector) using new O-rings (C) by holding the shift solenoid valve body; be sure that the mounting bracket contacts to the servo body. Install shift solenoid valve A (brown connector) using new O-rings (D) by holding the shift solenoid valve body; be sure that the mounting bracket contacts to the bracket of shift solenoid valve B. Install shift solenoid valve C (brown connector) using new O-rings (A) by holding the shift solenoid valve body; be sure that the mounting bracket contacts to the servo body. Install shift solenoid valve D (black connector) using new O-rings (B) by holding the shift solenoid valve body; be sure that the mounting bracket contacts to the servo body. 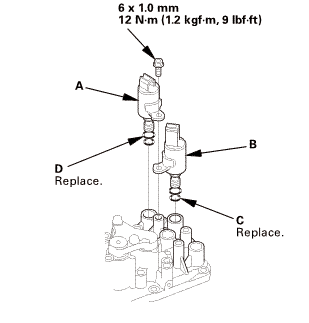 Install the regulator separator plate (A) and the dowel pins (B). 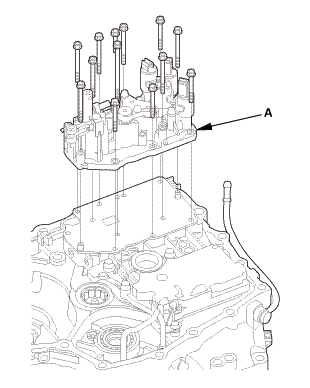 Install the stator shaft (A) using a new O-ring (B). 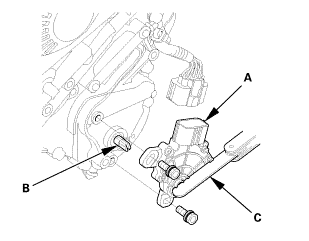 Install the stator shaft stop (C). 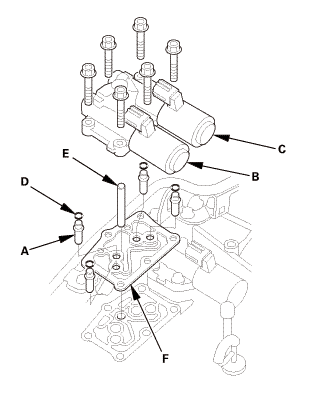 Install the regulator valve body (A). 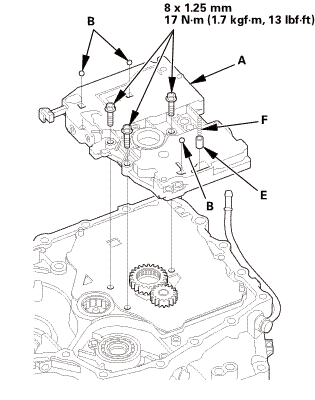 Install the differential assembly (A). Assemble the mainshaft, the countershaft, and the secondary shaft. Join the mainshaft subassembly (A), the countershaft subassembly (B), and the secondary shaft subassembly (C) together, and install them. 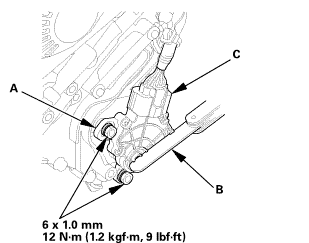 Install the reverse shift fork (A) with the reverse selector (B) together. 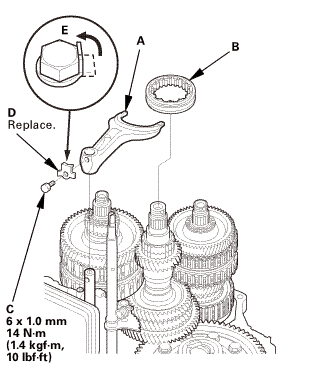 Install the lock bolt (C) using a new lock washer (D). Bend the lock tab (E) of the lock washer against the bolt head. Install the needle bearing (A). 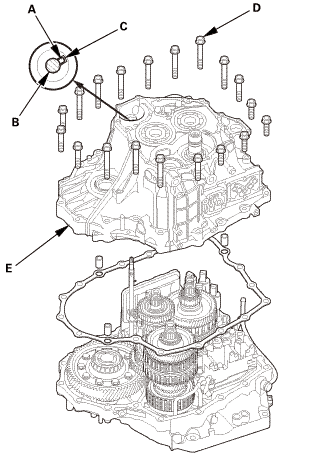 Install the countershaft reverse gear (B). 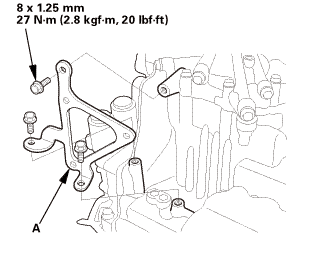 Install the three dowel pins (A) and a new gasket (B). 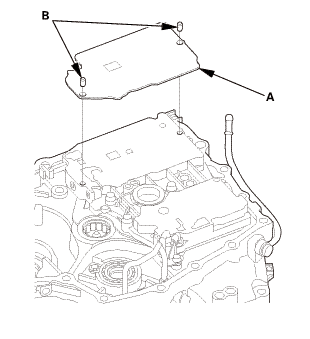 Align the spring pin (C) of the selector control shaft (D) with the transmission housing groove (E). NOTE: Do not squeeze the end of the selector control shaft tips together when turning the shaft. 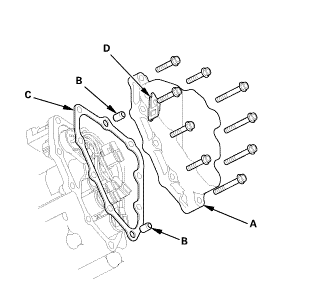 If the tips are squeezed together, it will cause a faulty shift position signal or position due to the play between the selector control shaft and the transmission range switch. 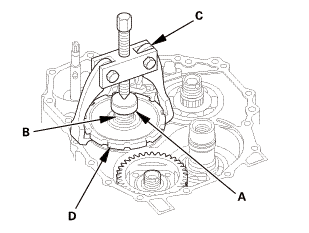 Place the transmission housing (F) on the torque converter housing (G). NOTE: Do not install the input shaft (mainshaft) speed sensor and the output shaft (countershaft) speed sensor before installing the transmission housing. Wrap the tip of a screwdriver with tape so the reverse idler gear teeth do not get damaged. 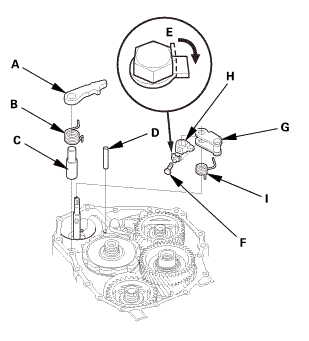 Engage the reverse idler gear (H) with the reverse gears (I) by rotating the idler gear using the screwdriver. 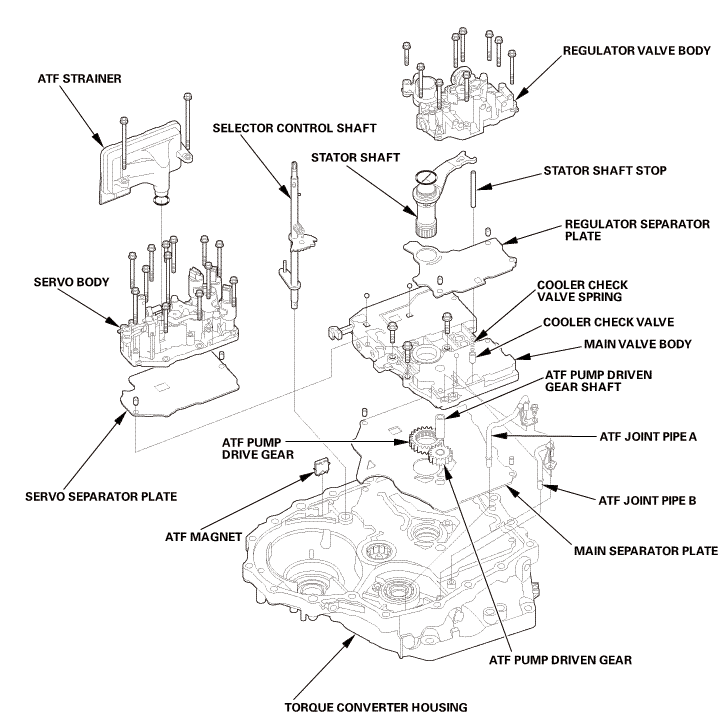 Make sure the transmission housing is securely seated so there is no clearance between the transmission housing and the torque converter housing. 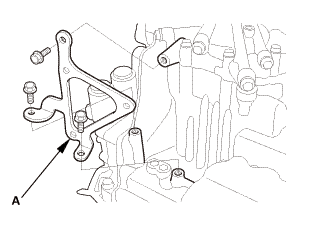 Install and tighten the transmission housing mounting bolts in at least two steps, in a crisscross pattern. Splines and threads of the mainshaft. Splines of the mainshaft idler gear. The old conical spring washer and the old locknut. 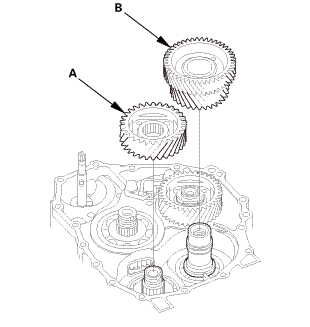 Install the mainshaft idler gear (A), the old conical spring washer (B), and the old locknut (C), and tighten the locknut to 216 N·m (22.0 kgf·m, 159 lbf·ft). Do not tap the mainshaft idler gear to install. Use a torque wrench to tighten the locknut. Do not use an impact wrench. Splines and threads of the secondary shaft and the idler gear shaft. Splines of the secondary shaft idler gear. Install the secondary shaft idler gear (A). NOTE: Do not tap the idler gear to install. 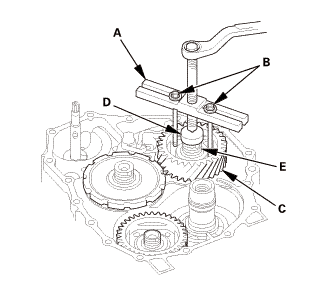 Install the idler gear shaft idler gear (B). Set the gear installer set on the idler gear shaft and the idler gear. Tighten the installer nut to install the idler gear part-way. NOTE: The installer nut has left-hand threads. Install the old conical spring washer (A) and the old locknut (B), and tighten the locknut to 225 N·m (23.0 kgf·m, 166 lbf·ft). Do not tap the idler gears to install. Secondary shaft locknut has left-hand threads. Retighten the installer nut to seat the idler gear in the idler gear shaft until it stops. Remove the gear installer set. 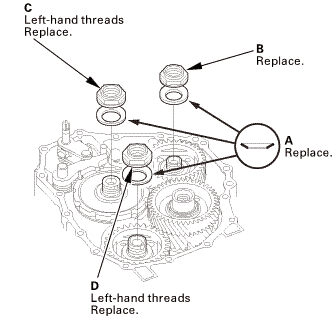 Install a new snap ring (A). Check that the snap ring is seated securely into the groove. Splines and threads of the countershaft. Splines of the park gear. 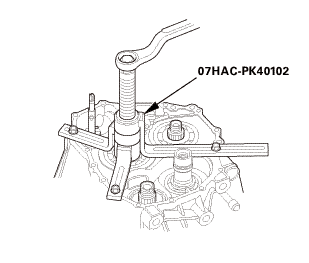 Install the park gear (A), the old conical spring washer (B), and the old locknut (C). 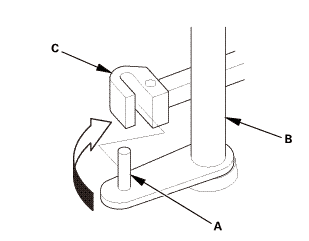 Install the park lever spring (D), the park lever (E), and the park lever stop (F). 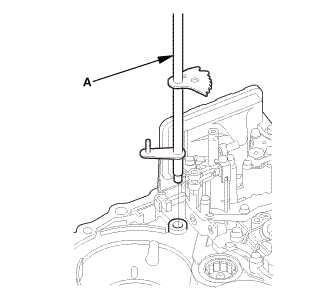 Install the lock bolt (G) using a new lock washer (H). NOTE: Do not bend the lock tab of the lock washer until inspect the park lever stop. Install the park pawl shaft (I), the park pawl spring (J), the park pawl (K), and the stop shaft (L). Lift the park pawl up, and engage it with the park gear, and tighten the locknut to 225 N·m (23.0 kgf·m, 166 lbf·ft). Do not tap the park gear to install. Park gear locknut (countershaft locknut) has left-hand threads. Remove the old locknuts and the old conical spring washers from the mainshaft, the countershaft, and the secondary shaft. Splines and threads of the mainshaft, the countershaft, and the secondary shaft. New conical spring washers and new locknuts. 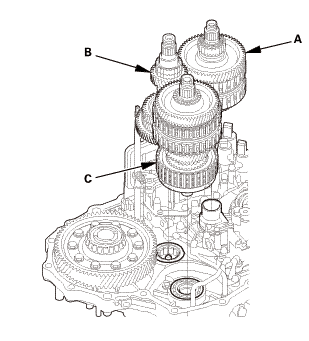 Areas where the conical spring washers contact the mainshaft idler gear, the secondary shaft idler gear, and the park gear. 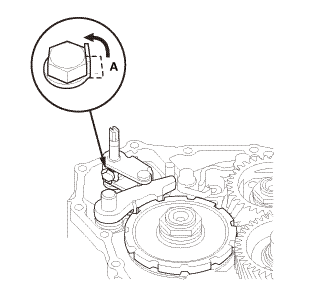 Install new conical spring washers (A) with facing stamped mark side up in the direction shown. 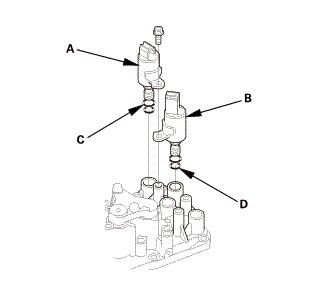 Install a new mainshaft locknut (B), a new countershaft locknut (C), and a new secondary shaft locknut (D). Tighten the mainshaft locknut to 155 N·m (15.8 kgf·m, 114 lbf·ft). Tighten the countershaft and secondary shaft locknuts to 167 N·m (17.0 kgf·m, 123 lbf·ft). 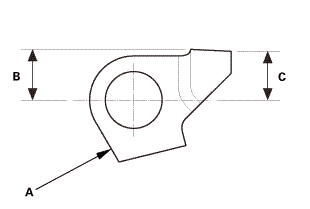 Stake the locknuts into the shafts to a depth (A) of 0.7－1.3 mm (0.027－0.051 in) using a 3.5 mm punch (B). Set the park lever in the P position. 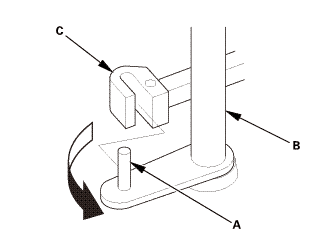 Measure the distance (A) between the park pawl shaft center (B) and the extension line (C) connected centers of the park lever roller pin (D) and the control shaft (E) in the vertical direction from the extension line. If the measurement is out of the standard, select and install the appropriate park lever stop (A) from the table. After replacing the park lever stop, make sure the distance is within the tolerance. Bend the lock tab (A) of the lock washer against the bolt head. Install the 6 x 199 mm ATF pipe (A). Install the 8 x 192.5 mm ATF pipe (B). Install the 8 x 180.5 mm ATF pipes (C). 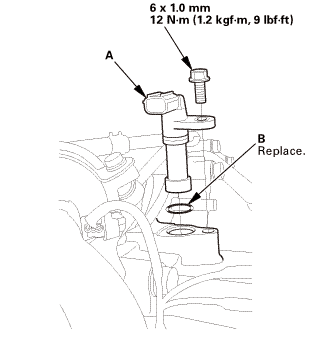 Install the ATF lubrication pipe (D). 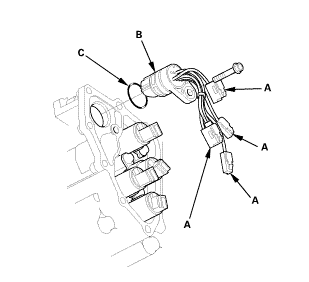 Install the shift solenoid wire harness (E) using a new O-ring (F). Install the ATF inlet line/ATF hose/ATF filter assembly (A). 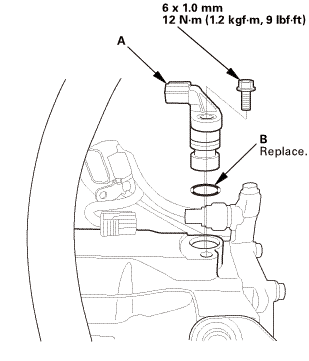 Install the banjo bolt (B) using new sealing washers (C). Clean the mounting surfaces and the fluid passages of the solenoid valve body and the transmission housing. Install a new gasket (A) with the blue side down and the white side up on the transmission housing. Install the 50 mm ATF pipe (D) and the ATF joint pipes (E). Install new O-rings (F) over the ATF joint pipes. 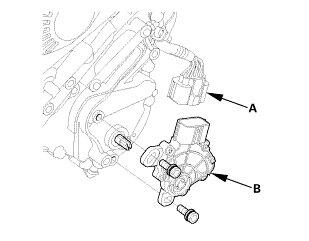 Install A/T clutch pressure control solenoid valves B and C.
Install a new gasket (B) with the blue side down and the white side up on the transmission housing. Install the 35 mm ATF pipe (C) and the ATF joint pipes (D). Install new O-rings (E) over the ATF joint pipes. 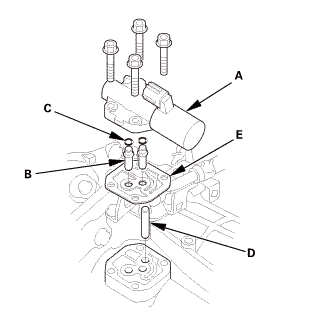 Install A/T clutch pressure control solenoid valve A. 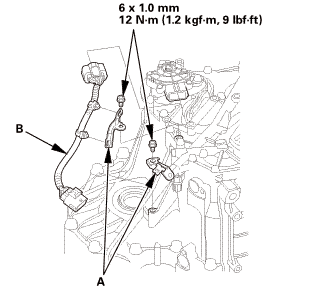 Install the output shaft (countershaft) speed sensor (A) using a new O-ring (B). 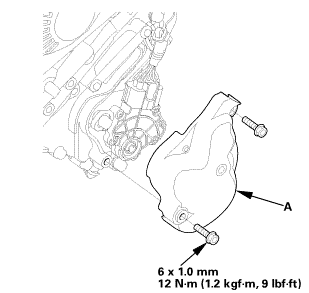 Install the input shaft (mainshaft) speed sensor (A) using a new O-ring (B). 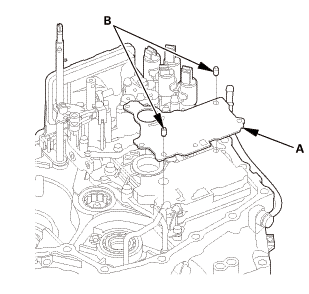 Install the dowel pins (A) and a new gasket (B). Install new O-rings (C) over the ATF pipes. Install the end cover (D). Install the ATF warmer bracket (A). Install the clamp brackets (A). 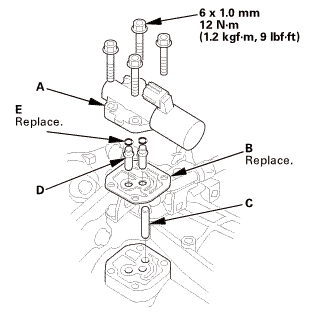 Install the transmission range switch subharness (B). Make sure the selector control shaft is in the N position. If necessary, move the selector control shaft to the N position. NOTE: Do not use the selector control shaft to adjust the shift position. If the selector control shaft tips are squeezed together it will cause a faulty signal or position due to play between the selector control shaft and switch. 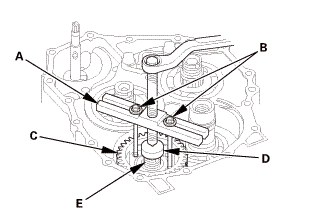 Align the cutouts (A) on the rotary-frame with the neutral positioning cutouts (B) on the transmission range switch (C), then put a 2.0 mm (0.079 in) feeler gauge blade (D) in the cutouts to hold the switch in the N position. NOTE: Be sure to use a 2.0 mm (0.079 in) blade or equivalent to hold the switch in the N position. Install the transmission range switch (A) gently on the selector control shaft (B) while holding it in the N position with the 2.0 mm (0.079 in) blade (C). 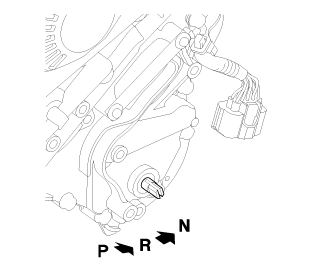 Tighten the bolts on the transmission range switch (A) while you continue holding the N position. NOTE: Do not move the transmission range switch when tightening the bolts. Remove the feeler gauge (B). Check the connector (C) for corrosion, dirt, or oil, and clean or repair if necessary, then connect the connector securely. 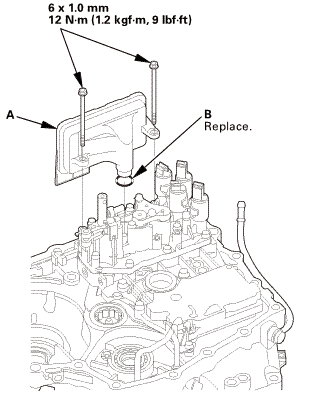 Install the transmission range switch cover (A).